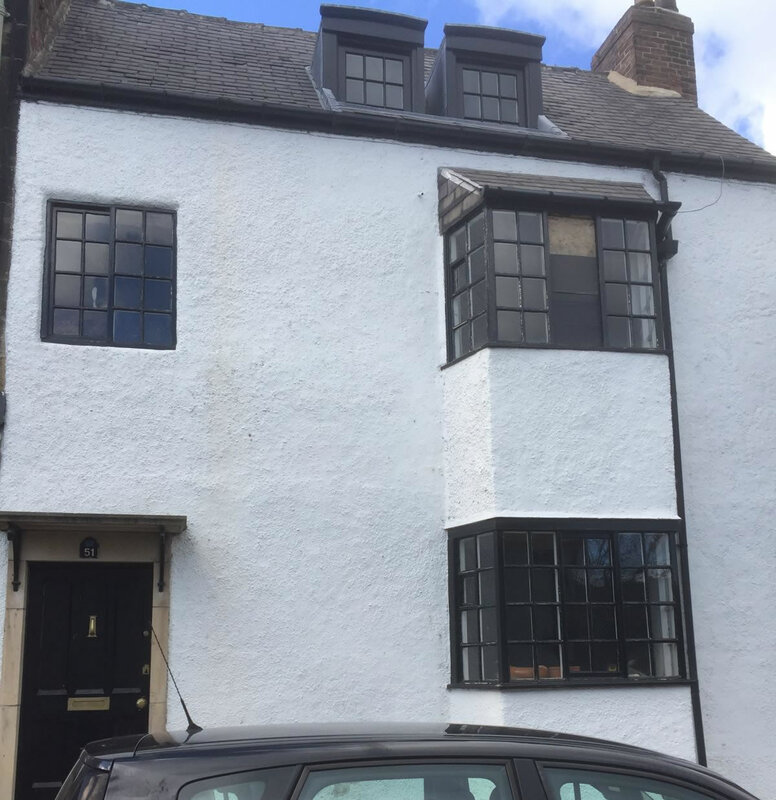 Project Brief: Complete renovation and refurbishment of a Grade II listed Residential Property in an historic area of the city, with stunning views of the iconic cathedral and castle. 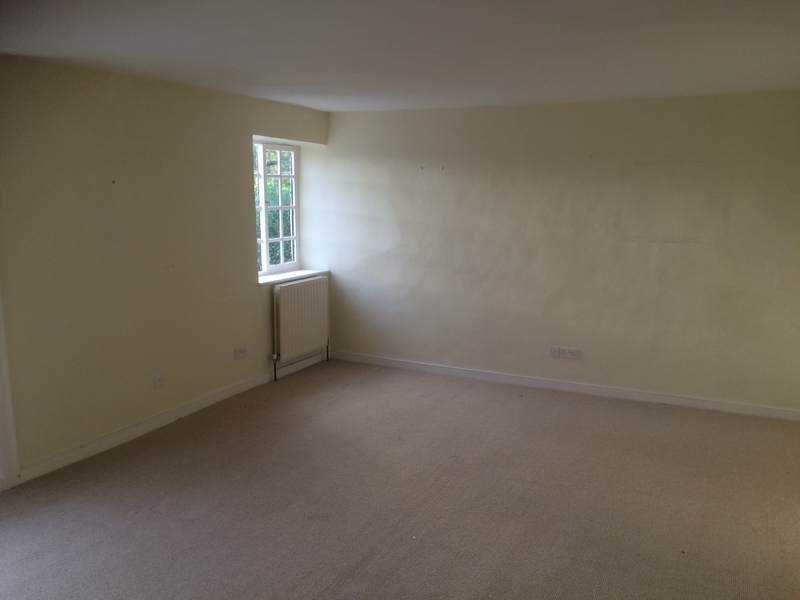 The building work commenced on 4th January 2016, the contract to be concluded within 13 weeks. The access to the site was restricted to a one-way, narrow cobbled street, with enthusiastically enforced parking restrictions. The access to the property was via the front door. In addition, with the building being listed a Grade II, and around 350 years old, it required extensive renovation and shortly after commencing the contract it was established that the floors and the roof would require complete renewal and substantial structural repair. 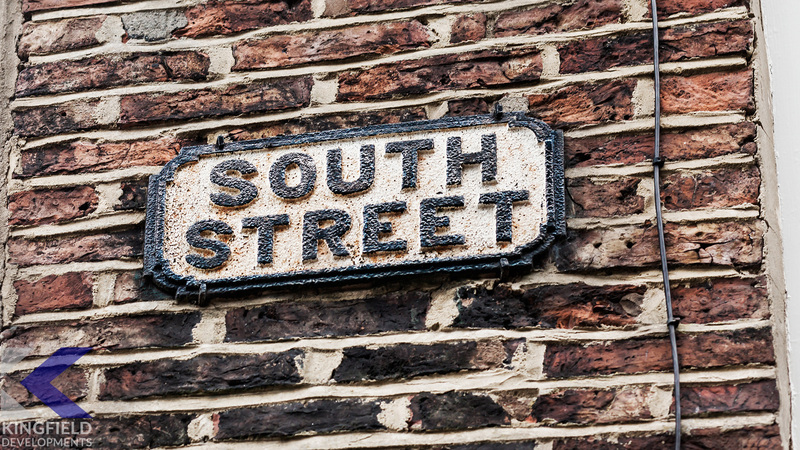 It was was also subject to conservation restrictions, under the watchful eye of Durham City Council Building Control. 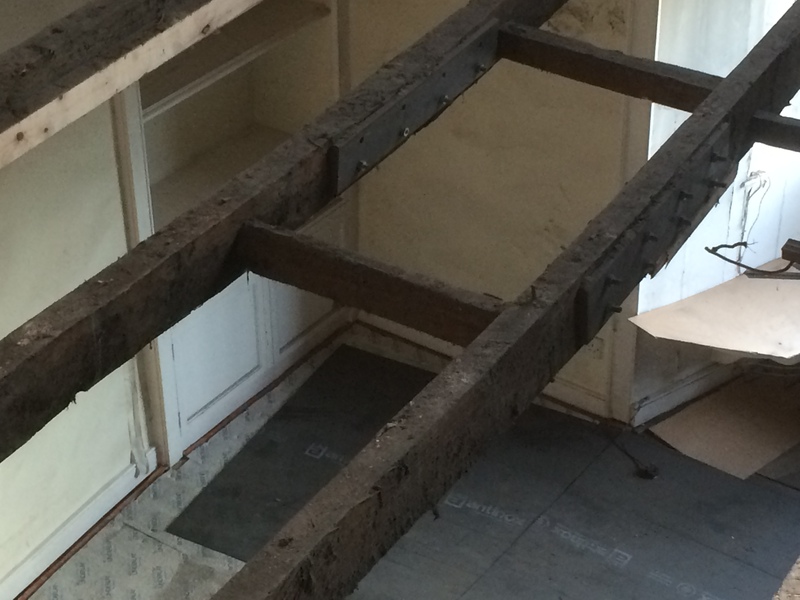 Shortly after work started, it was discovered that, due to the founding level of the existing walls being just below floor level and existing ground level, some areas required underpinning and additional design consideration had to be given to the method of supporting the internal walls because it would impact upon the level of the proposed new floor. The roof was completely renewed. 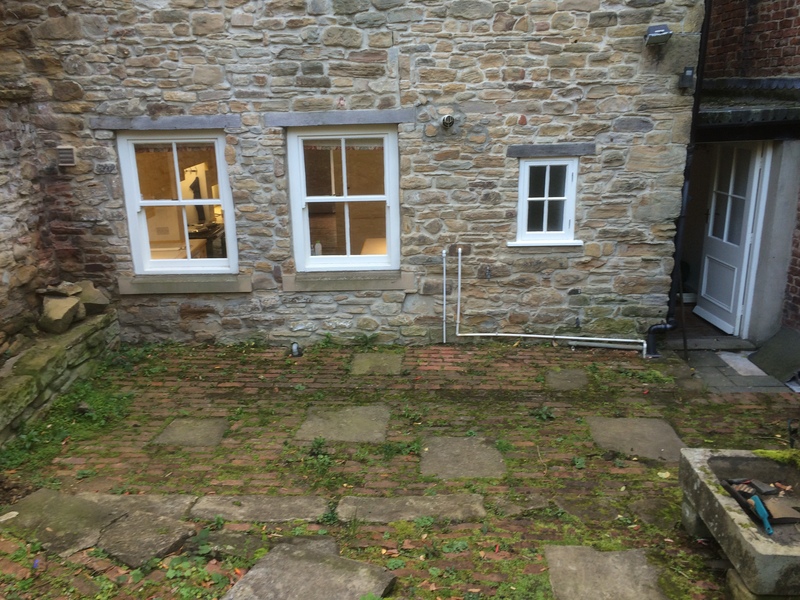 The existing bay windows had to be replaced in exactly the same designs as the previous windows, despite being single-glazed. 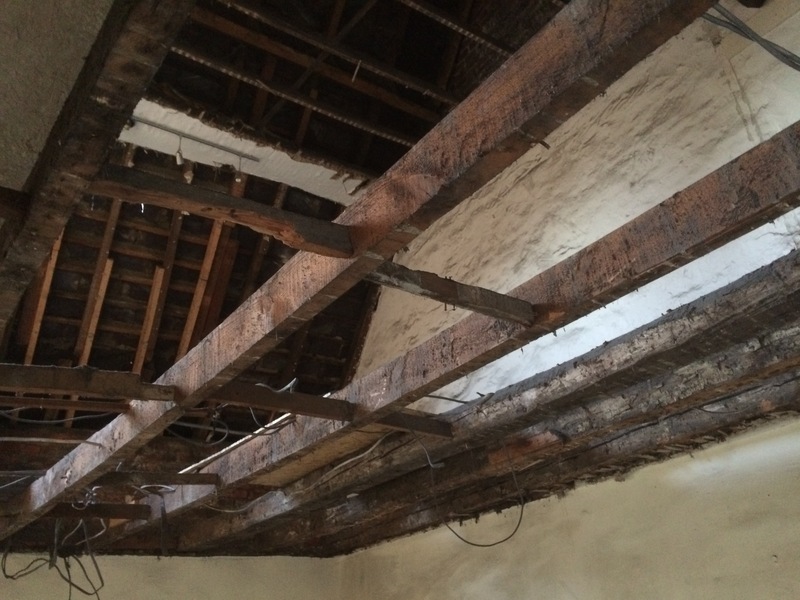 Extensive remedial works were carried out to the internal openings by replacement of existing timbers which in many cases were rotten. 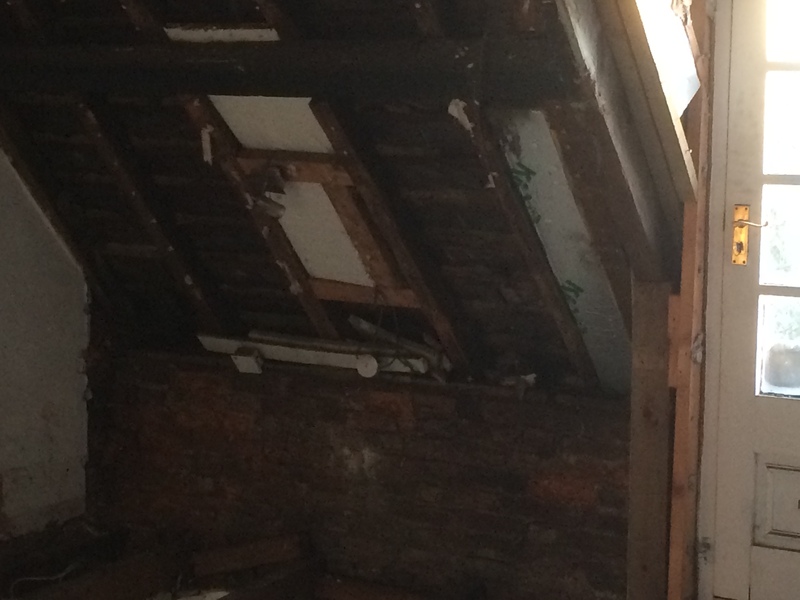 The method of replacing the top floor was originally designed to incorporate a steel beam spanning some 8 metres. However, this was impractical as it would not have been possible to manoeuvre such a large and heavy steel beam within the confines of the building. 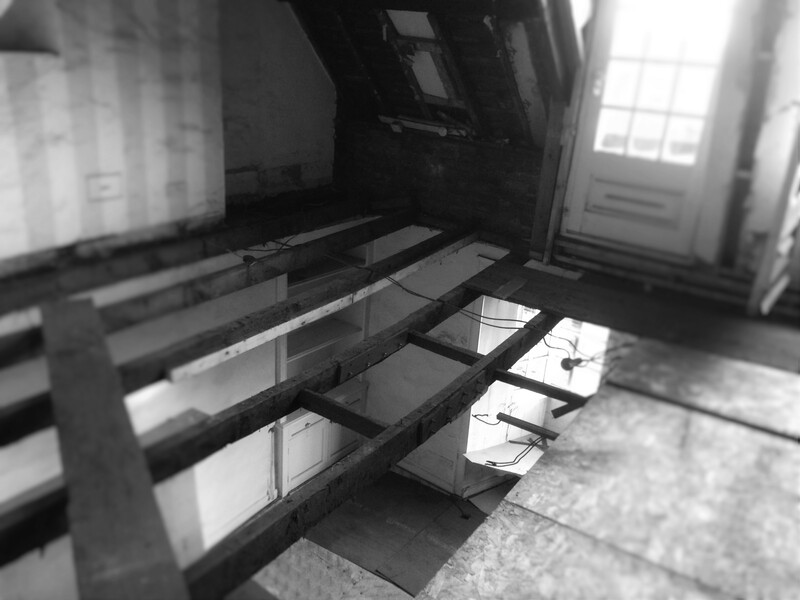 This required an assessment and redesign to allow a timber beam structure to be put in place, which would also require the the existing roof structure to be be supported while the remedial work was carried out and the re-roofing took place. The top floor originally consisted of three rooms, two of which faced east and overlooked the cathedral and castle at the front of the house. These two rooms were made into a single master bedroom with sliding/folding doors which now frames this spectacular view. 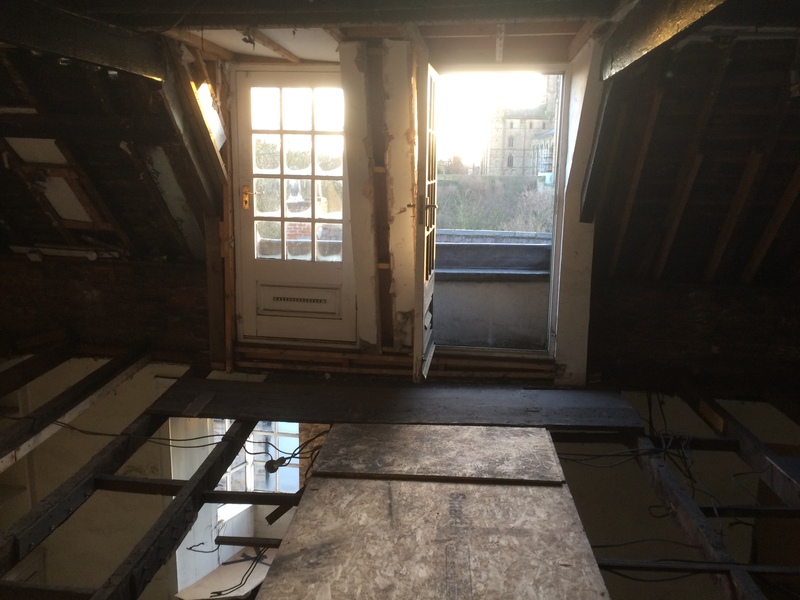 The third room on the top floor was converted from a washroom into a guest bedroom with a new rooflight installed. 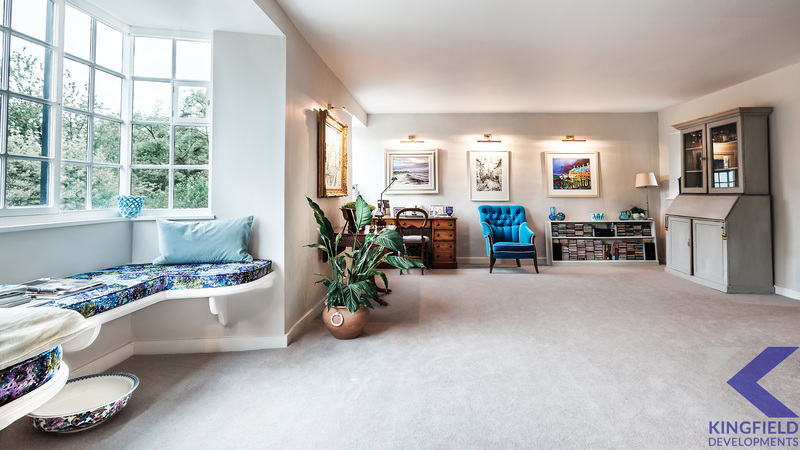 The first floor sitting room required a new floor and plasterwork. It also required replacement of the existing bay window and surrounding seating area to exactly match - in accordance with conservation requirements. 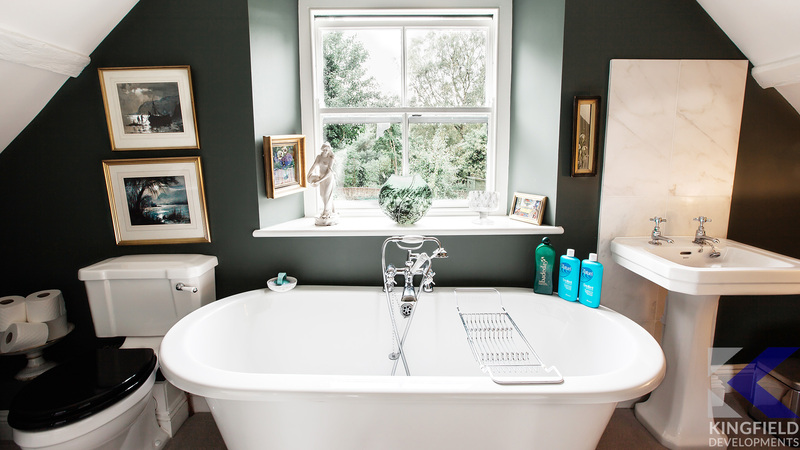 Also, on the first floor, a new bathroom was fitted, as well as a refurbishment of a guest bedroom and en-suite shower room. 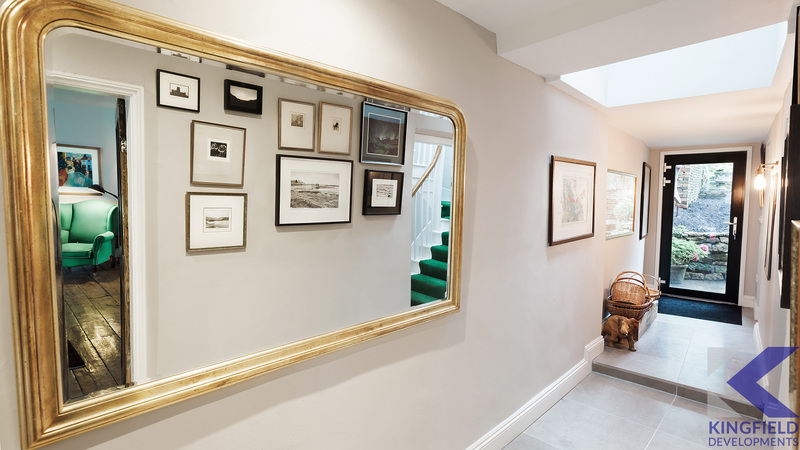 The stairway, was refurbished and the original [wood type] bannister rail re-installed along with the addition of new bookcases and a window to bring in more sunlight. 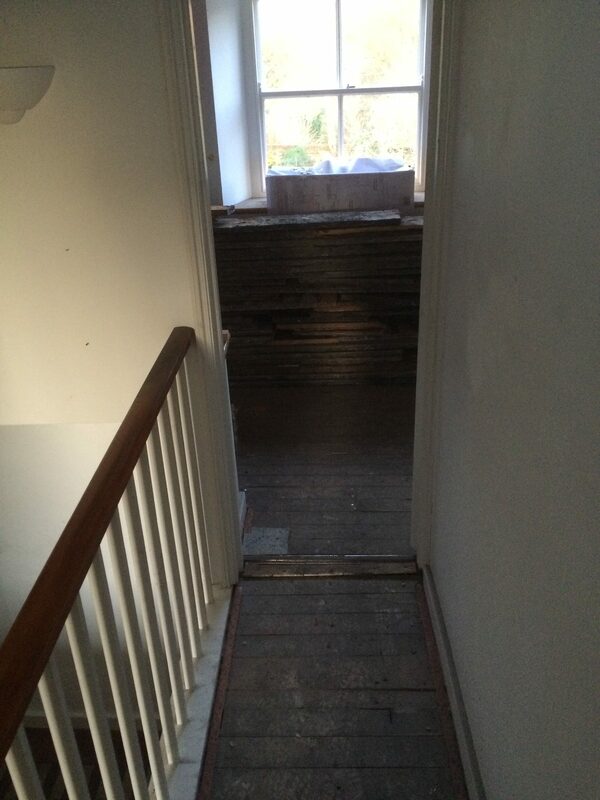 The ground floor passageway flooring was completely replaced, as was the backdoor, with a full length glass door. 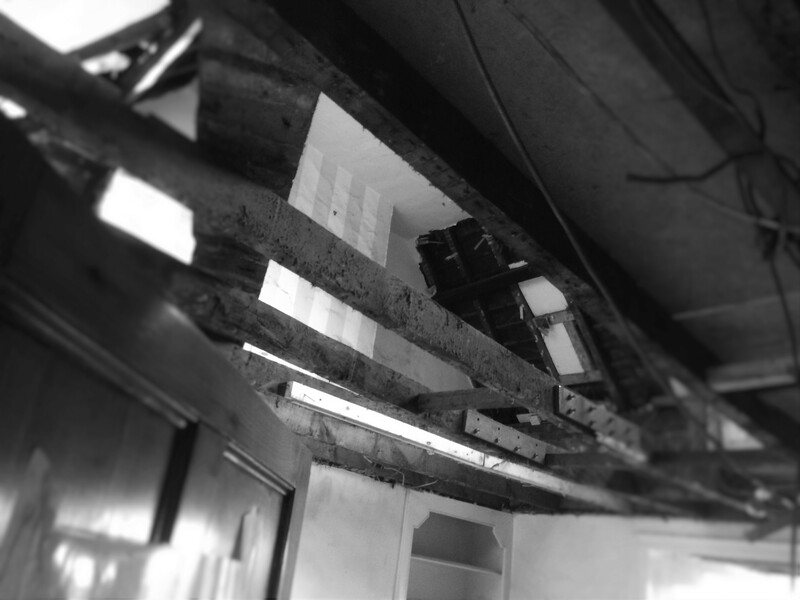 Also added was a large rooflight, again to allow more natural light into what was previously a rather dark passageway. 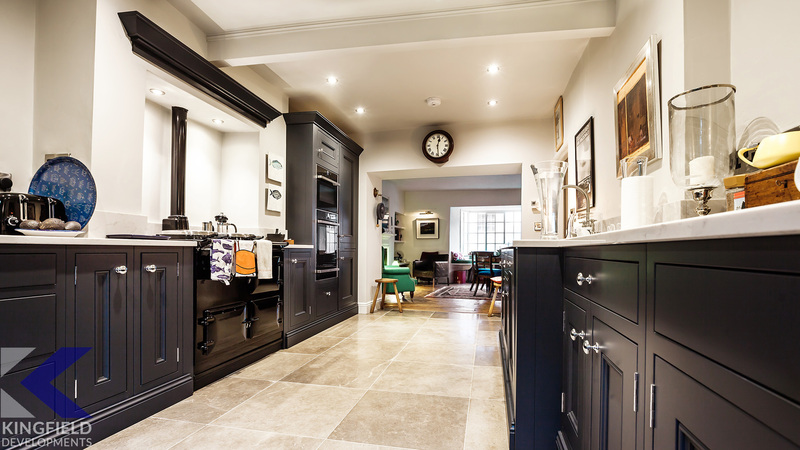 The living room to the front of the house required the floor taking up and drainage running through from the kitchen to be connected to the external drainage by the front door. 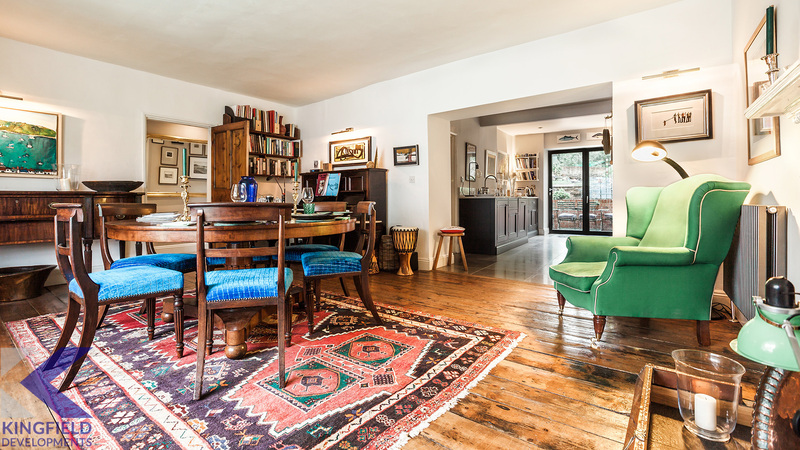 The original wooden flooring was then relaid to maintain the original look. 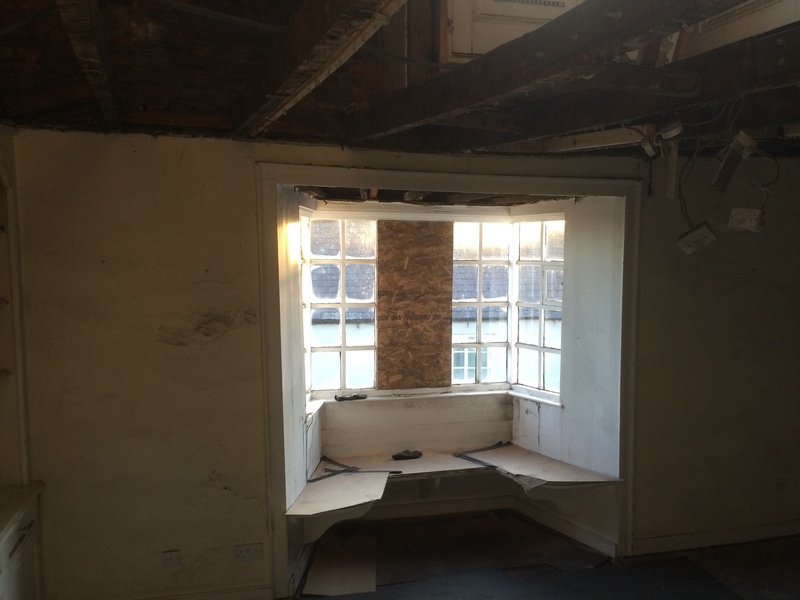 The bay window and seating area was again replaced like-for-like in accordance with conservation requirements. 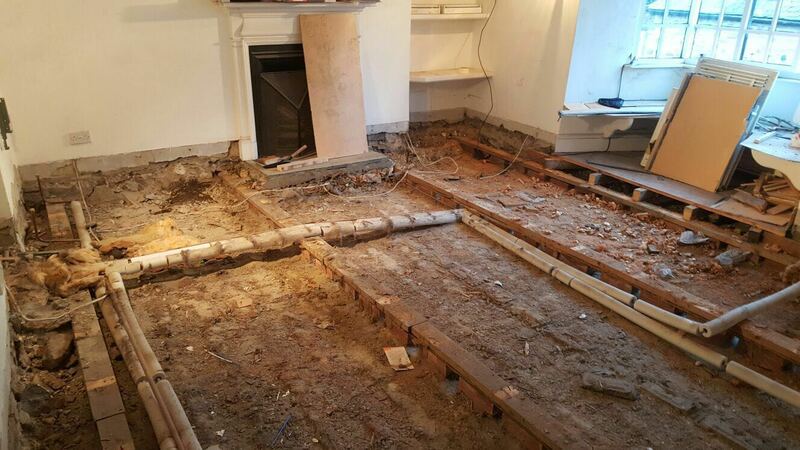 The kitchen-living room entrance was significantly widened to allow more light through the ground floor. This was a particularly involved piece of work due to the requirement to bolster the supporting lintels [Am I correct?]. 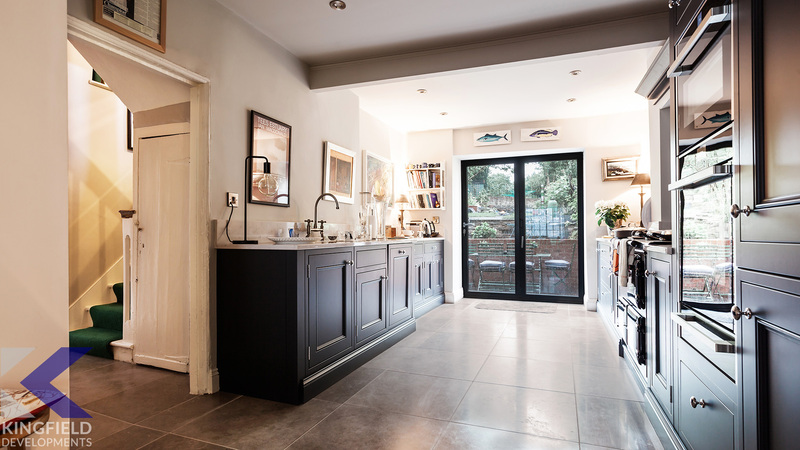 Sliding-folding doors were also fitted to the rear of the kitchen to allow more light in and ease of access to the rear garden. 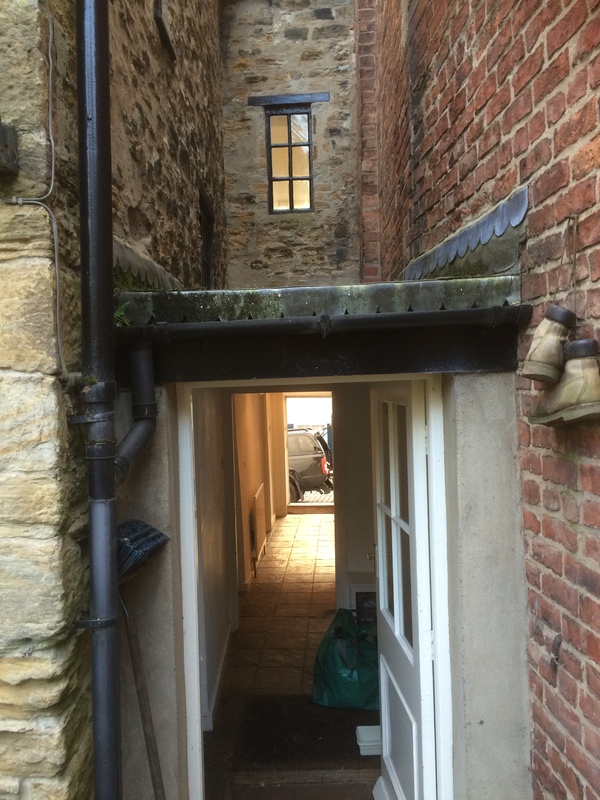 This required knocking out a large section of the rear wall and some skilled stonemasonry. 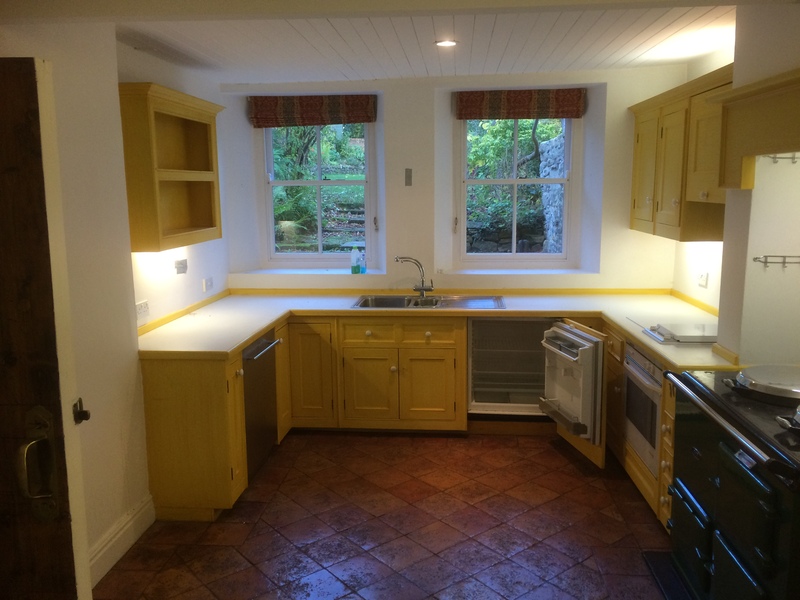 An underfloor heating system was fitted to the kitchen area and new kitchen was fitted. This required careful programming to avoid upsetting existing remedial work. 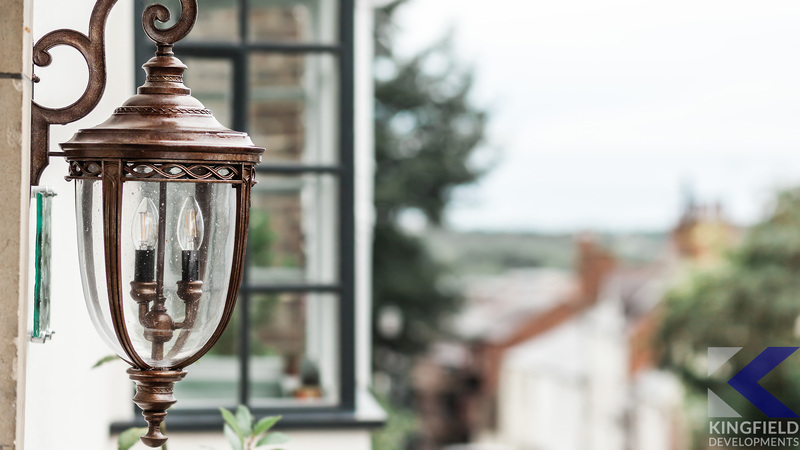 The entire building was re-wired and new lighting systems installed to showcase the special features of this historic property. 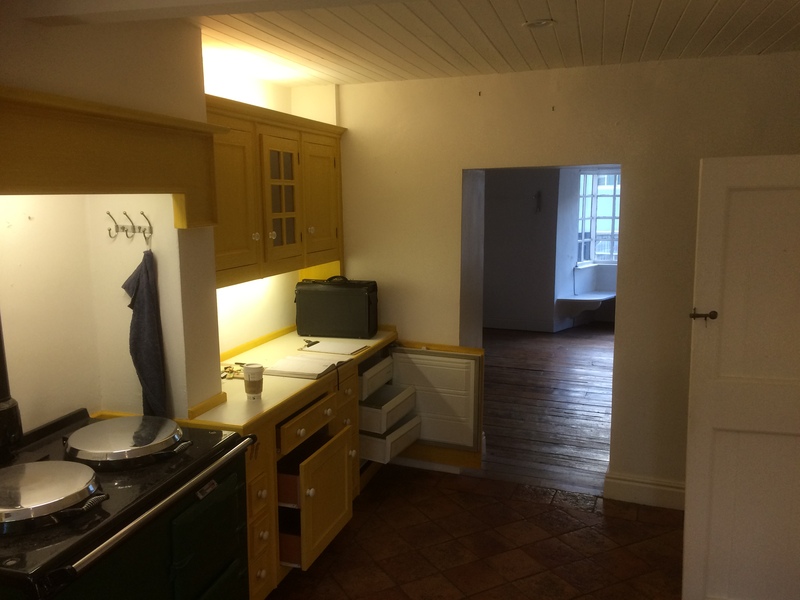 All three floor required significant plasterwork, the top floor required complete re-plastering while the other floors required plasterwork to ‘made good’. 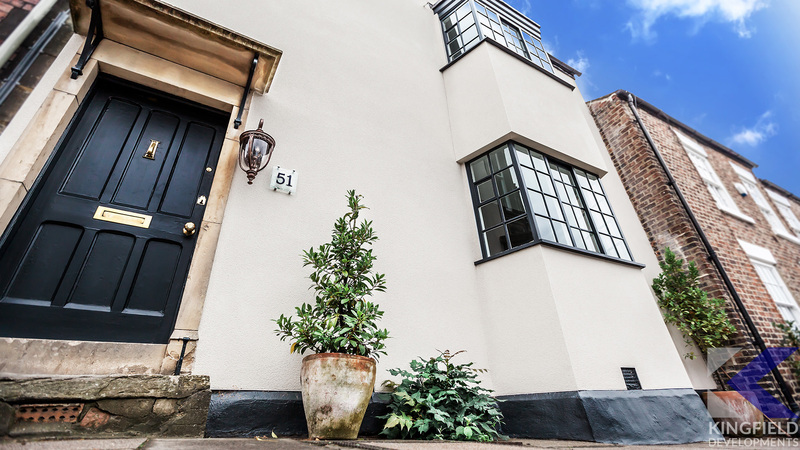 The front of the building was completely stripped of its original render and re-rendered to using a special lime-based render system. The entire roof structure was replaced and re-tiled, adding new flashings and guttering. 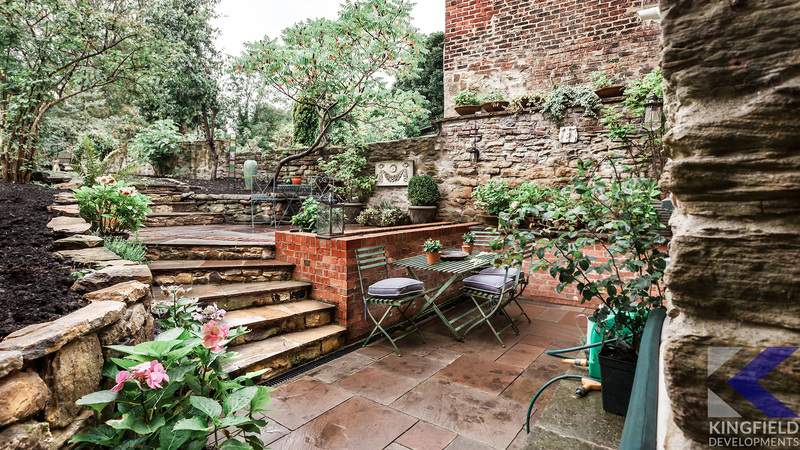 The rear garden was landscaped adding patios at various levels. 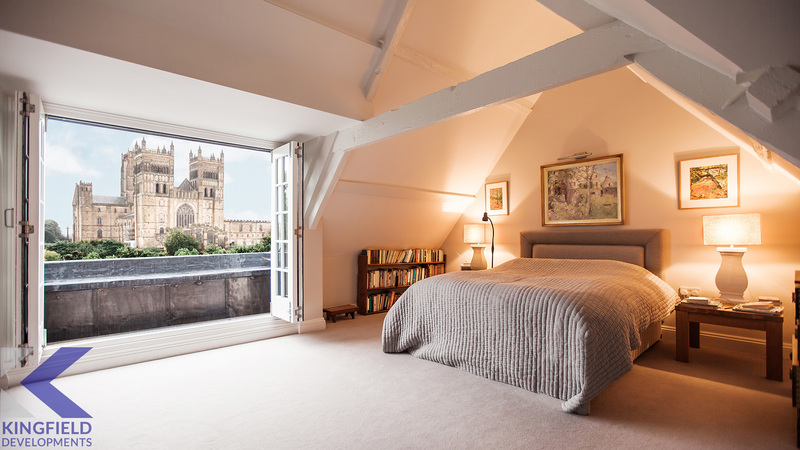 We think you will agree that the end result is stunning, and with the owner's interior design and furnishings taking full advantage of the improvements allowing in more light and the spectacular view over the river to the cathedral and castle.